The Newtown tragedy has prompted 15 states to loosen gun restrictions. Miranda Green on why the pro-gun side is winning. If you live in Arkansas, you can now carry a concealed gun into a bar, or a liquor store—or a church. 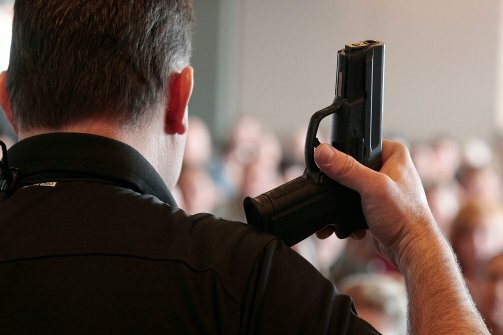 College staffers can bring guns on campus. Folks with a permit from other states can pack heat in Arkansas without filing any paperwork. These are among the half-dozen legal changes in the state that passed only four months since the Newtown massacre, and Arkansas has plenty of company. While the Senate failed to pull the trigger on expanded background checks last week, 15 states have already passed 25 gun rights measures this year. “To me this isn’t really about guns. It’s about what level of personal security you want to let legal law-abiding citizens have,” says Arkansas state Sen. Bryan King, a Republican who introduced the Church Protection Act that allows guns in places of worship. He says the school shooting only solidified the view of gun rights activists that similar massacres could be prevented if more people carried guns. With the first Republican majority in the state since 1874, most Arkansas legislators agreed that personal security should be elevated—it took no more than a month for each of the gun rights bills to pass into law. Flowers’s opposition produced lots of angry e-mails from activists. “I think it’s unfortunate that the public doesn’t really understand and can’t put into context what the conversation is really about in terms of the legislation proposed here in Arkansas or in Congress,” she says. While the focus of debate in Washington has been on tightening gun restrictions, states like Arkansas have embarked on the opposite route in embracing their firearms. According to the Law Center to Prevent Gun Violence, 15 states have enacted some 31 laws regarding guns so far in 2013. Of them, more than 80 percent increase gun rights by, among other things, allowing owners to carry their guns in more places and making it easier for applicants to obtain a permit to carry a concealed weapon. In Mississippi, one new law relaxes the definition of “conceal” for residents whose firearms may become visible as they wear them. The sponsor, Republican state Sen. Giles Ward, says people in his state consider their Second Amendment rights “sacred” and that the bill was passed to address fears that a federal law could erode those rights. “One does not have to get very far from a television set or a newspaper or magazine to realize that there are those that clearly have an agenda right now, and that there are some of those with power who have it within their authority to severely restrict Second Amendment rights,” Ward says. In addition to the gun rights legislation, 38 states took a more drastic path by proposing nullification laws that make them virtually immune to any nationwide gun control law if one is passed. Such bills became law in Tennessee and Virginia, although whether the courts would uphold their constitutionality remains debatable. Another reason, says Dave Workman, communications director for the Citizens Committee for the Right to Keep and Bear Arms, is that gun ownership is growing. “If you look at firearm sales over the last couple of years they have skyrocketed. Look at the number of people who have applied for and received concealed-carry permits, it certainly appears to anybody that more Americans are purchasing firearms,” Workman says. The National Rifle Association is a significant force in these local battles as well as at the federal level. Pro-gun groups, including the NRA, spent $2.3 million lobbying state legislatures between 2007 and 2012. However, far more media attention has focused on the handful of states that have tightened gun laws in the wake of the Newtown school shooting. Connecticut, Colorado, and New York have adopted strict new laws, and Maryland has passed similar legislation that is awaiting Gov. Martin O’Malley’s signature. Colorado’s bill, signed in early March, expanded background checks on gun purchases and limited the amount of ammunition available in magazines. A month later, the Connecticut bill added more than 100 firearms to its assault weapon ban list and created a dangerous weapon offender registry, a first-of-its-kind in the nation. New York’s gun bill is the most recent of the trio. Signed last week, it combined the measures brought up by Connecticut and Colorado and put specific emphasis on registering guns that are newly classified as assault weapons and banned sales within state. Given the paralysis in Washington, the action is likely to remain at the state level.